Piracy is a robbery committed at sea, or outside the normal jurisdiction of any state, by an agent without a commission from a sovereign nation. There have existed, throughout history, many famous and terrorizing pirates who, in the popular modern imagination, operated outside the restricting bureaucracy of modern life. Privateers, commissioned by a government to prey upon enemy vessels, operated with the "marque" of their state but shared the gains amongst themselves. A lucrative business, they often continued their operations after their commission was rescinded. 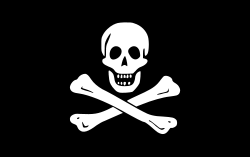 In reality, however, piracy was a tough, dangerous business—many pirates ate poorly, did not become wealthy, and died young. The occurrence of piracy was closely related to international trade, as those involved in piracy would have experience of sailing the trade routes. Also, at the conclusion of maritime wars, crews from the vessels might become pirates, either through mutiny against their former captain and state, or by being recruited by existing pirates after the navy disbanded. Because piracy takes place outside the jurisdiction of any state, prosecution by sovereign states is a complex issue. However, because of universal jurisdiction, international law permits action to be taken against pirates without objection from the flag state of the pirate vessel. The modern pirating era, which, although somewhat different from the original image of pirates, still persists to a lesser extent. However, the practice of hijacking ships and airplanes has developed into a new form of piracy, albeit often with political motives. Despite the best efforts of naval and merchant seamen to resist piracy, in areas where there is lawlessness or serious economic deprivation piracy will be found. 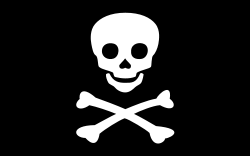 The elimination of piracy, as with the crime of robbery and other related crimes, is not to be achieved by stricter laws, more effective law enforcement, or harsher penalties (for those have already been used), but rather in changes within individual human beings and in their relationships to each other and society. When everyone has the opportunity to live a life that is satisfying, emotionally and financially, and feels that they are part of one harmonious family of humankind, resorting to acts of piracy will no longer be attractive or necessary. The Latin term pirata, from which the English pirate is derived, derives ultimately from Greek peira (πείρα) "attempt, experience," implicitly "to find luck on the sea." The word is also cognate to "peril." In the popular modern imagination, pirates of the classical period were rebellious, clever teams who operated outside the restricting bureaucracy of modern life. In reality, many pirates ate poorly, did not become fabulously wealthy, and died young. Unlike traditional Western societies of the time, many pirate "clans" operated as limited democracies, demanding the right to elect and replace their leaders. The captain of a pirate ship was often a fierce fighter in whom the men could place their trust, rather than a more traditional authority figure sanctioned by an elite. However, when not in battle, the ship's quartermaster usually had the real authority. Many groups of pirates shared in whatever they seized; pirates injured in battle might be afforded special compensation. Often terms were agreed upon and written down by the pirates, but these articles could also be used as incriminating proof that they were outlaws. Pirates readily accepted outcasts from traditional societies, perhaps easily recognizing kindred spirits, and they were known to welcome them into the pirate fold. Such practices within a pirate clan were tenuous, however, and did little to mitigate the brutality of the pirate's way of life. The classical age of piracy coexisted with a rise in English imperialism, which required merchant vessels to transport goods and warships to protect the trade ships from pirates and privateers. Living conditions on the warships were horrible even by seventeenth-century standards; sailors were often fed rotten, maggot-infested food, frequently suffered from scurvy or other nutritional disorders, and could be counted lucky to escape their service without a crippling injury. English captains were known to have been extremely brutal; the captain held a nearly sovereign power aboard his ship and many were unafraid to abuse that power. 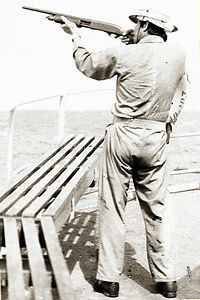 To fill the warships, officers would forcibly pressgang boys and young men to replace lost crew. The appalling living conditions, constant threat to life, and brutality of the captain and his officers pushed many men over the edge. Possessing seafaring skill, a learned intolerance for absolute authority, and a disdain for the motherland they might have believed abandoned them, many crews would simply mutiny during an attack and offer themselves and their ship as a new pirate vessel and crew. 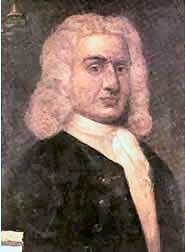 William Kidd, privateer, eighteenth-century portrait. A privateer or corsair used similar methods to a pirate, but acted while in possession of a commission or letter of marque from a government or monarch authorizing the capture of merchant ships belonging to an enemy nation. For example, the United States Constitution of 1787 specifically authorized Congress to issue letters of marque and reprisal. The letter of marque was recognized by international convention and meant that a privateer could not technically be charged with piracy while attacking the targets named in his commission. This nicety of law did not always save the individuals concerned, however, as whether one was considered a pirate or a legally operating privateer often depended on whose custody the individual found himself in—that of the country that had issued the commission, or that of the object of attack. Spanish authorities were known to execute foreign privateers with their letters of marque hung around their necks to emphasize Spain's rejection of such defenses. Furthermore, many privateers exceeded the bounds of their letters of marque by attacking nations with which their sovereign was at peace (Thomas Tew and William Kidd are notable examples), and thus made themselves liable to conviction for piracy. However, a letter of marque did provide some cover for such pirates, as plunder seized from neutral or friendly shipping could be passed off later as taken from enemy merchants. The famous Barbary Corsairs of the Mediterranean were privateers, as were the Maltese Corsairs, who were authorized by the Knights of St. John. 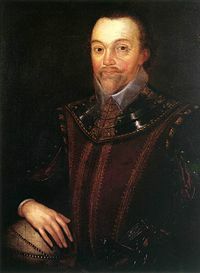 One famous privateer was Sir Francis Drake. His patron was Queen Elizabeth I, and their relationship ultimately proved to be quite profitable for England. Under the Declaration of Paris of 1854, seven nations agreed to suspend the use of the letter of marque, and others followed in the 1907 Hague Convention. A wartime activity similar to piracy involves disguised warships called commerce raiders or merchant raiders, which attacked enemy shipping commerce, approaching by stealth and then opening fire. Commerce raiders operated successfully during the American Revolution. During the American Civil War, the Confederacy sent out several commerce raiders, the most famous of which was the CSS Alabama. During World War I and World War II, Germany also made use of these tactics, both in the Atlantic and Indian oceans. Since commissioned naval vessels were openly used, these commerce raiders should not be considered even privateers, much less pirates—although the opposing combatants were vocal in denouncing them as such. The earliest documented incidence of piracy is the exploits of the Sea Peoples who threatened the Aegean civilization in the thirteenth century B.C.E. In classical antiquity, the Tyrrhenians and Thracians were known as pirates. The island of Lemnos long resisted Greek influence and remained a haven for Thracian pirates. By the first century B.C.E., there were pirate states along the Anatolian coast, threatening the commerce of the Roman Empire. Among some of the most famous ancient pirateering peoples were the Illyrians, populating the western Balkan Peninsula. Constantly raiding the Adriatic Sea, the Illyrians caused many conflicts with the Roman Republic. It was not until 68 B.C.E. that the Romans finally conquered Illyria and made it a province, ending their threat. On one voyage across the Aegean Sea in 75 B.C.E., Julius Caesar was kidnapped by pirates and held prisoner in the Dodecanese islet of Pharmacusa. He maintained an attitude of superiority throughout his captivity. When the pirates thought to demand a ransom of twenty talents of gold, he insisted they ask for fifty. After the ransom was paid, Caesar raised a fleet, pursued and captured the pirates, and imprisoned them in Pergamon. The governor of Asia refused to execute them as Caesar demanded, preferring to sell them as slaves. However, Caesar returned to the coast and had them crucified on his own authority, as he had promised to when in captivity—a promise the pirates had taken as a joke. The Senate finally invested Pompey with special powers to deal with piracy in 67 B.C.E. 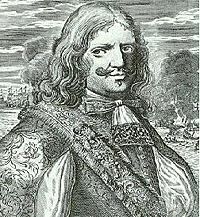 (the Lex Gabinia), and after three months of naval warfare he managed to suppress the threat. Piracy was common in all waters around Europe for centuries. Some examples of their exploits are noted. After the Slavic invasions of the Balkan Peninsula in the fifth and sixth centuries, Serbs were given the land of Pagania between Croatian Dalmatia and Zachlumia in the first half of the seventh century. These Slavs revived the old Illyrian piratical habits and often raided the Adriatic Sea. By 642 they invaded southern Italy and assaulted Siponte in Benevento. Their raids in the Adriatic increased rapidly, until the whole sea was no longer safe for travel. Despite signing a treaty with Venice, the "Narentines," as they were called, soon broke it and continued their piracy for centuries. Saint Patrick was captured and enslaved by Irish pirates. The Vikings were Scandinavian pirates who attacked the British Isles and Europe from the sea, reaching south as far as Italy, and east by river to Russia, Iran, and the Byzantine Empire. In the twelfth century, the coasts of west Scandinavia were plundered by Slavic pirates from the southwest coast of the Baltic Sea. The ushkuiniks were Novgorodian pirates who looted the cities on the Volga and Kama rivers in the fourteenth century. Since the fourteenth century, the Deccan was divided into two antagonistic entities: on the one side stood the Bahmani Sultanate, and on the other stood the Hindu rajas rallied around the Vijayanagara Empire. Continuous wars demanded frequent supplies of fresh horses, which were imported through sea routes from Persia and Arabia. This trade was subjected to frequent raids by thriving bands of pirates based in the coastal cities of Western India. 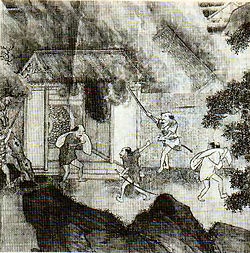 Attacks by the Wokou, fourteenth-century painting. From the thirteenth century, Japan-based Wokou made their debut in East Asia, initiating invasions that would persist for 300 years. Piracy in Southeast Asia began with the retreating Mongol Yuan fleet after the betrayal by their Sri Vijayan allies in the war with Majapahit. They preferred the junk, a ship using a more robust sail layout. Marooned navy officers, consisting mostly of Cantonese and Hokkien tribesmen, set up their small gangs near river estuaries, mainly to protect themselves. They recruited locals as common foot-soldiers known as “lang” (lanun) to set up their fortresses. They survived by utilizing their well-trained pugilists, as well as marine and navigation skills, mostly along Sumatran and Javanese estuaries. Their strength and ferocity coincided with the impending trade growth of the maritime silk and spice trade routes. However, the most powerful pirate fleets of East Asia were those of Chinese pirates during the mid-Qing Dynasty. Pirate fleets grew increasingly powerful throughout the early nineteenth century. The effects that large-scale piracy had on the Chinese economy were immense. They preyed voraciously on China’s junk trade, which flourished in Fujian and Guangdong and was a vital artery of Chinese commerce. Pirate fleets exercised hegemony over villages on the coast, collecting revenue by exacting tribute and running extortion rackets. In 1802, the menacing Zheng Yi inherited the fleet of his cousin, Captain Zheng Qi, whose death provided Zheng Yi with considerably more influence in the world of piracy. 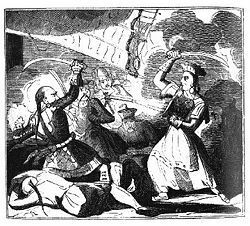 Zheng Yi and his wife, Zheng Yi Sao (who would eventually inherit the leadership of his pirate confederacy) then formed a pirate coalition that, by 1804, consisted of over ten thousand men. Their military might alone was sufficient to combat the Qing navy. However, a combination of famine, Qing naval opposition, and internal rifts crippled piracy in China around the 1820s, and it has never again reached the same status. The great or classic era of piracy in the Caribbean extends from around 1560 up until the mid-1760s. The period during which these pirates, often called "buccaneers" were most successful was from the 1640s until the 1680s. Caribbean piracy arose out of, and mirrored on a smaller scale, the conflicts over trade and colonization among the rival European powers of the time, including England, Spain, Dutch United Provinces, and France. Some of the best-known pirate bases were New Providence, in the Bahamas from 1715 to 1725, Tortuga established in the 1640s, and Port Royal after 1655. Piracy has long been a mainstay in North Africa. Pirates from Africa raided the Spanish coast on behalf of the Ottoman Empire during the sixteenth century until the Battle of Lepanto, in which the Ottomans were defeated and withdrew efforts of piracy. Also in the sixteenth century, pirates from the Barbary Coast frequently attacked merchant ships and threatened the livelihood of the nascent colonies there. During the Hundred Years' War, the French and English both negotiated with pirates from Tripoli, Tunis, and Algiers to protect their own ships within range and to encourage raids on the other side. This piracy continued until the beginning of the nineteenth century when a joint effort of the United States, Great Britain, and the Netherlands crushed the corsairs based in Tripoli. In English admiralty law, piracy was defined as petit treason during the medieval period, and offenders were accordingly liable to be drawn and quartered on conviction. Piracy was redefined as a felony during the reign of Henry VIII. In either case, piracy cases were cognizable in the courts of the Lord High Admiral. English admiralty vice-admiralty judges emphasized that "neither Faith nor Oath is to be kept" with pirates; in other words, contracts with pirates and oaths sworn to them were not legally binding. Pirates were legally subject to summary execution by their captors if captured in battle. In practice, instances of summary justice and annulment of oaths and contracts involving pirates do not appear to have been common. Since piracy often takes place outside the territorial waters of any state, the prosecution of pirates by sovereign states represents a complex legal situation. The prosecution of pirates on the high seas contravenes the conventional freedom of the high seas. However, because of universal jurisdiction, action can be taken against pirates without objection from the flag state of the pirate vessel. This represents an exception to the principle extra territorium jus dicenti impune non paretur (the judgment of one who is exceeding his territorial jurisdiction may be disobeyed with impunity). Modern pirates prey on cargo ships that must slow their speed to navigate narrow straits, making them vulnerable to be overtaken and boarded by small motorboats. Small ships are also capable of disguising themselves as fishing vessels or cargo vessels when not carrying out piracy in order to avoid or deceive inspectors. In most cases, modern pirates are not interested in the cargo and are mainly interested in taking the personal belongings of the crew and the contents of the ship's safe, which might contain large amounts of cash needed for payroll and port fees. In some cases, the pirates force the crew off the ship and then sail it to a port to be repainted and given a new identity through false papers. Pirates often operate in regions of poor countries with smaller navies and large trade routes. They may evade pursuers by sailing into waters controlled by their enemies. With the end of the Cold War, navies have decreased size and patrol, and trade has increased, making organized piracy far easier. Modern pirates are sometimes linked with organized crime syndicates, but often are parts of small individual groups. 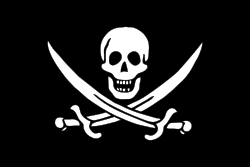 Pirate attack crews may consist of a small group of ten or fewer sailors for going after a ship's safe (raiding) or a larger group with as many as 70 (depending entirely on the ships and the ships’ crew size) if the plan is to seize the whole vessel. Modern piracy can also take place in conditions of political unrest. For example, following the U.S. retreat from Vietnam, Thai piracy was aimed at the many Vietnamese who took to boats to escape. Further, following the disintegration of the government of Somalia, warlords in the region have attacked ships delivering UN food aid. In modern times, ships and airplanes may be hijacked for political reasons. The perpetrators of these acts could be described as pirates (for instance, the French for "plane hijacker" is pirate de l'air, literally "air pirate"), but in English are usually termed "hijackers." An example is the hijacking of the Italian civilian passenger ship Achille Lauro, which is generally regarded as an act of piracy. Edward Teach, aka Blackbeard, pirate in the Caribbean, eighteenth-century lithograph. Jack Rackham, aka Calico Jack, pirate of the Caribbean, eighteenth-century lithograph. ↑ According to Suetonius, The Life of Julius Caesar 4, The Lives of the Twelve Caesars (Loeb Classical Library, 1913). Plutarch, The Life of Julius Caesar 1.8–2, The Parallel Lives (Loeb Classical Library, 1919), says this happened earlier, on his return from Nicomedes's court. Velleius Paterculus, Book II: Chapters 29–58: 2:41.3-42, Roman History (Loeb Classical Library, 1924), says merely that it happened when he was a young man. All links retrieved November 15, 2007. ↑ Bryan A. Garner, ed., Black's Law Dictionary, 8th ed. (Thomson West, 2004 ISBN 0-314-15199-0). ↑ Reuters, Pirates Open Fire on Cruise Ship off Somalia, Washington Post, November 5, 2005. Retrieved November 15, 2007. Kimball, Steve. The Pyrates Way Magazine. Retrieved November 15, 2007. 1680-1730: Pirates and Anglo-American piracy in the Atlantic. Pirates of the Caribbean, in fact and fiction.